Bali to Gili Island, The Gili Islands are an archipelago of three islands situated off the northwestern coast of Indonesia’s Lombok Island. Despite being active tourist destinations at present, they were largely uninhabited until the late 1970s. After they became more popular, they began to attract tourists seeking a level of seclusion from the fast-paced modern world. Travelers seeking to visit these islands get there by sea or by air. Travelers from Bali to Gili Island previously had the choice of fast boats. However, fast boats priced the other two means of transport out of the route and they remain the most popular means of travel to the islands. Fast boats to Gili seat an average of 30 to 100 people. The permitted luggage weight per person is approximately 25 kilograms. The facilities aboard the vessels vary depending on the traveler’s budget and the operator’s available options. This also goes for standards aboard the many boats and the level of training of the crew. Prices also vary depending on the distance traveled, operator’s charges and other factors such as the age of the traveler. Seasonal pricing also affects the cost of the journey, although several booking companies and operators offer package deals and offers. Visitors must note that due to the distances covered by boats to Gili from Bali, day trips are rendered impossible. Accommodation must be booked before the journey is made. Furthermore, due to strong currents it is not advisable to attempt to swim between the islands. Any visitors wishing to travel from one Gili to another must use an island-hopper boat service. Gili Trawangan is the largest of the three, at approximately fifteen square kilometers, and is located farthest from Lombok’s northwestern coast. The preferred way to get from Bali to any of the Gilis is to travel to Gili Trawangan first and use island-hopper boats to get to either Gili Meno or Gili Air. 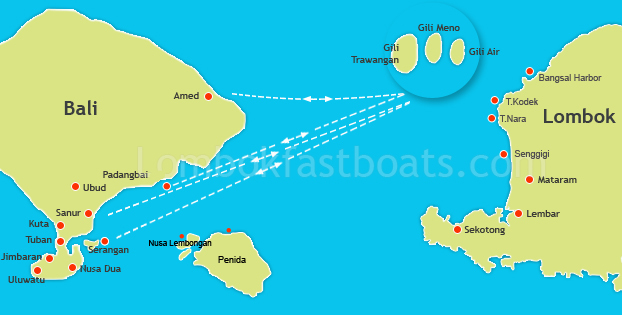 Boats to Gili Trawangan depart from Serangan Harbour, Padang Bai, Sanur Beach and Benoa Harbour. These departure points are from Bali, and depend on the travel operator and time of year. Travelers who wish to travel to the Gili Islands from Bali by sea have to take into account the time they wish to spend in a boat, the time they wish to spend on the road and their accommodation before they make the trip. The increase in number of visitors taking the trip has caused a vast improvement in standards and the availability of facilities on the islands and other supporting services. This is set to continue as more international visitors arrive to partake in the unique experience the Gilis have to offer.